In twenty-one years Hotel Palindrone travelled to about thirty countries (among them Malaysia, Mexico and India) – but they had never made it to Slovakia. Which is quite strange as the capital city Bratislava is more or less a stone’s throw from Vienna. Thanks to the Austrian Cultural Forum we could correct this gap in our travel agenda. 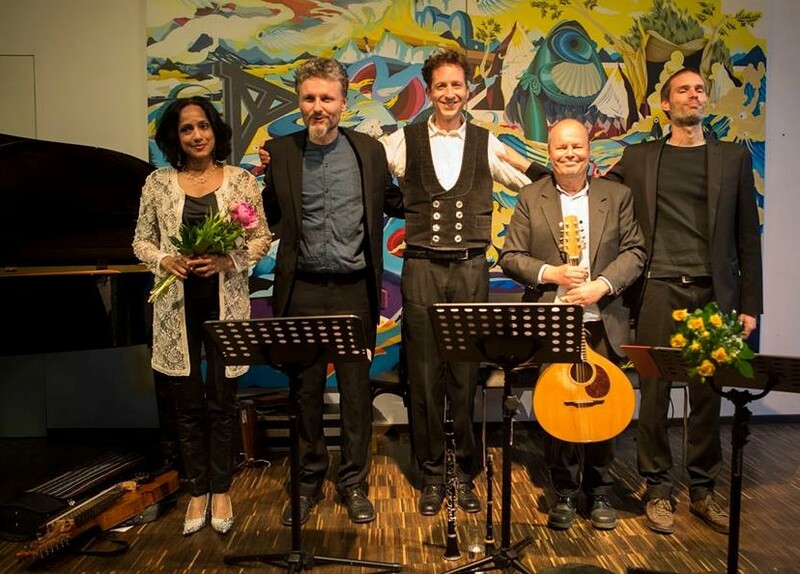 We were to present our program Tambdde Roza – from the Atlantic Sea to the Indian Ocean, which means that pianist and singer Marialena Fernandes (who had already performed in Bratislava) joined us. 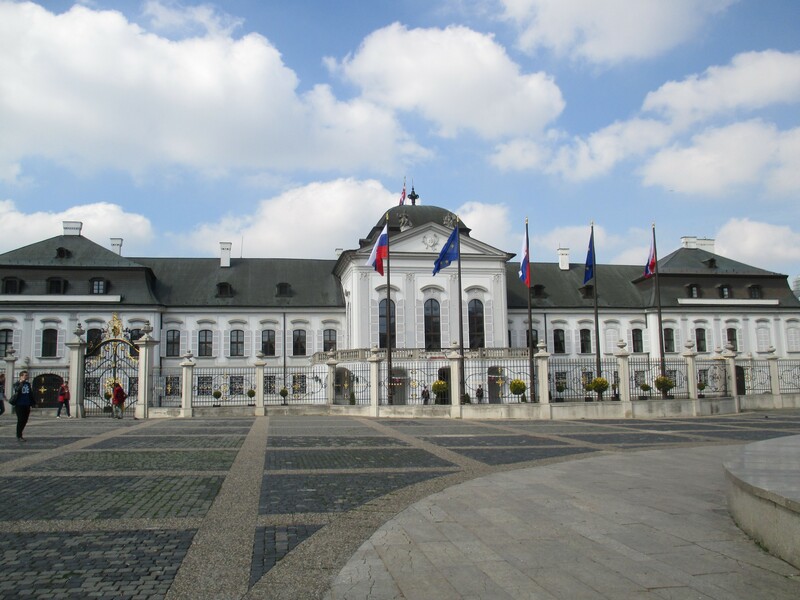 The ACF’s concert hall lies just oppostite the Slovak president’s residence – but the five musicians who have been working on their project Hotel Haydn for eight years did not think about actual politics when they saw Palais Grassalkovich. Their associations carried them to Joseph Haydn who had performed several times in this baroque palace built in 1760 by Antal Grassalkovich (a Hungarian magnate and Imperial Financial Administrator in Maria Theresia’s government). Let us delve a bit more into music history. 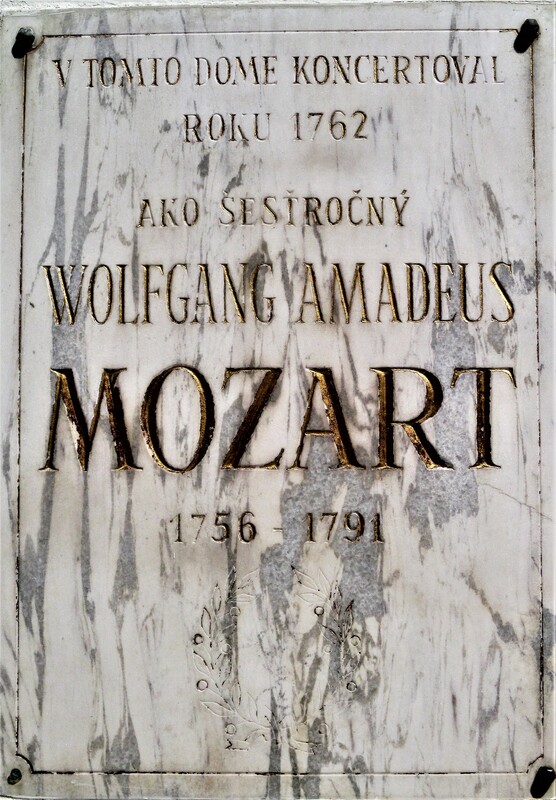 Strolling from the ACF to Saint Martin’s Cathedral you will pass by locations which boast about the presence of great musicians. 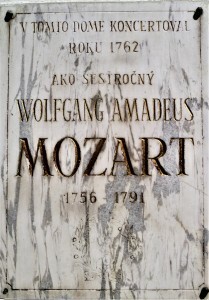 In 1762 six-year-old Wolfgang Amadeus Mozart enthused the audience at Palais Pálffy, in 1796 Ludwig van Beethoven showed up for some concerts (I could not find out where), in 1820 nine-year-old Franz Liszt rocked Palais de Pauli, and sixty-four years later the former wunderkind conducted his Coronation Mass in the cathedral. 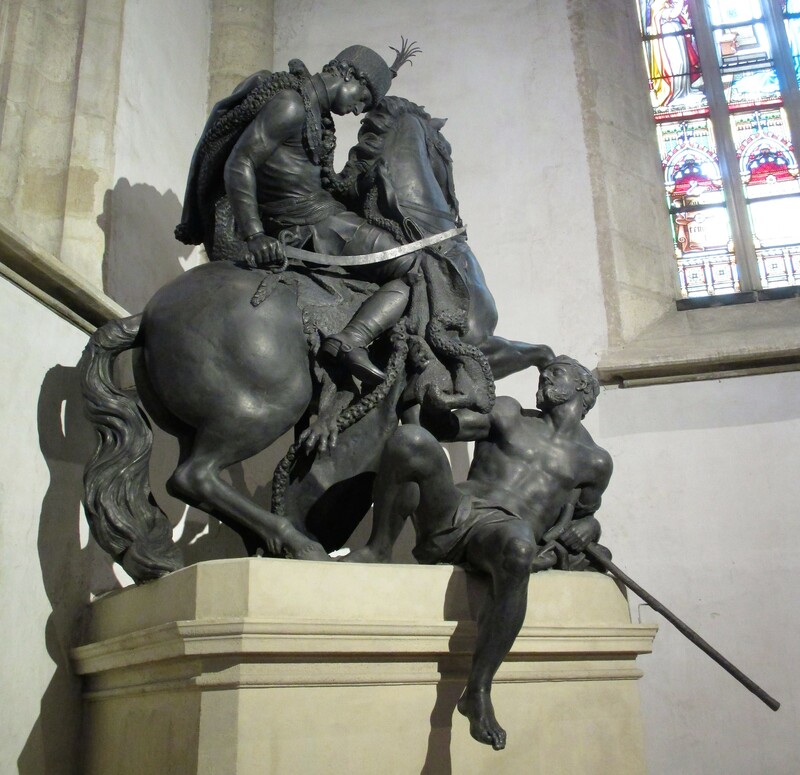 The gothic church is worth visiting, above all to have a look at the statue of Saint Martin, created by the Viennese sculptor Raphael Donner. In compliance with iconographic rules the church patron is doing business as usual (horse-sword-coat-beggar), but he looks pretty militant and sportsmanlike, wearing the uniform of a Hungarian hussar. 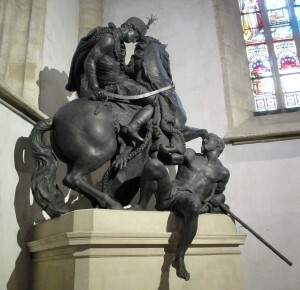 Probably Donner’s model for the most dare-devil-like Saint Martin in art history was archbishop and art sponsor Imre Esterházy. So naturally you should walk to Palais Ésterhazy where Joseph Haydn conducted the debut performance of his opera buffa La Canterina. 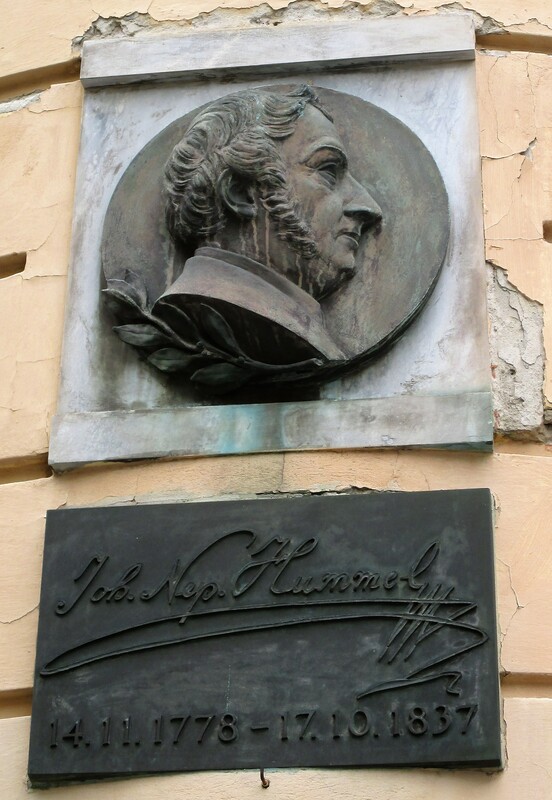 On your way back do not forget Johann Nepomuk Hummel’s house of birth, which is now a museum with a remarkable CD-shop. Next door you will find Vinotéka Urbana where you can taste Slovak wines. Finally music aficionados could commemorate the Moyzes family if they find a small lane called Moyezava. Mikulas and his son Alexander, as composers and teachers, are considered the founders of Slovak music. 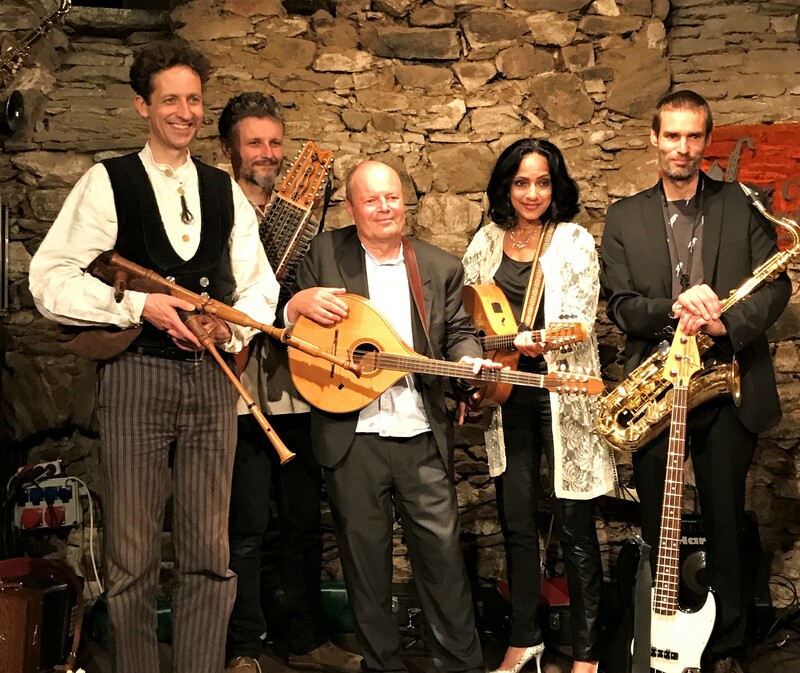 In any case, Bratislava has proved a forge of musical talents – shouldn’t the Palotian Five start reflecting about that? The next day back to Vienna – Ballsaal Palindrone at the Sargfabrik. Maybe we should call it Ballsaal Halay, because after the usual fervent opening by the Palotians (with piper Yunus Hentschel substituting Stephan Stoney Steiner) Dilan Sengül’s Turkish-Kurdish dancers and the Zurna-Davul-band Münür & Hasan added more heat, thus moving Ballsaal Palindrone geographically far to the South-East. 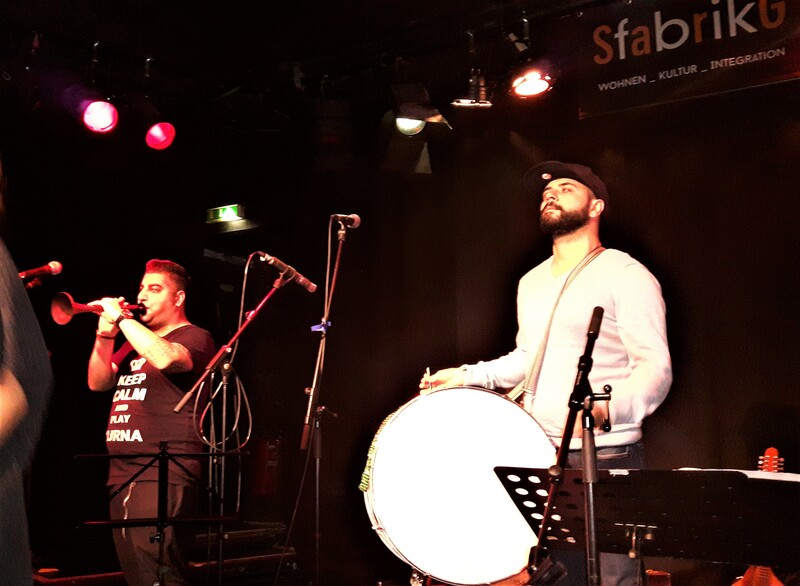 The dancers reeled and swirled tirelessly, and freaked out when the final session with Münür, Hasan and the Palotians speeded up the audience, playing dances from Anatolia and the Bretagne. When talking about Halay we should also mention Richard Schuberth, the grandmaster of any kind of literary genre and mastermind of Vienna’s world-music scene. 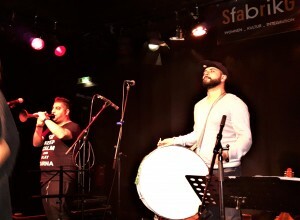 In an article titled Tanzen bis zum Umfallen – der Stereotype (hard to translate: dance until stereotypes topple over) Schuberth relates Kurdish Halay to Breton Festoú-noz, but he also discusses the “ethnitisation” of migrants and also points out in how far seemingly unpolitical issues can become political (for the whole article see Augustin, Aug 31, 2016). “In Turkey, Halay means dancing in lines or in circles, accompanied by instruments like the zurna and the davul. The Kurds call it Govend and the Armenians call it Kochari. On the coast of the Black Sea it is named Choron (which is related to the Romanian and eastern-Jewish Hora, as well as to the Bulgarian Horo, Macedonian Oro and the Kolo of Ex-Yugoslavia). I should not forget to mention the Greek Sirtos and the Cretan Pentozalis. Before the pre-bourgeois era, dances and dance music from Ireland to China were similar, as contemporary paintings prove. The church had its reasons to agitate against the bacchanal sound of bagpipes, shawms and drums. Until the 19th century the sinister succession of notes and wild strains were not a question of Orient and Occident. In Brittany, at the so-called Festóu-noz, they still engage in line dancing – which resembles the Anatolian version not only because of the steps, but also because of an instrument called bombarde. In his book Taksim ist überall. Die Gezi-Bewegung und die Zukunft der Türkei (Taksim everywhere. The Gezi-movement and Turkey’s future, published in 2014) Turkish-German journalist Deniz Yüksel also refers to the ambiguity of polical awareness and seemingly unpolitical action. He writes wherever you walked through the motley and colourful criss-cross at Taksim Square you would see Kurds dancing Halay. By the way, Deniz Yüksel is still detained in a Turkish prison. His crime: Writing. 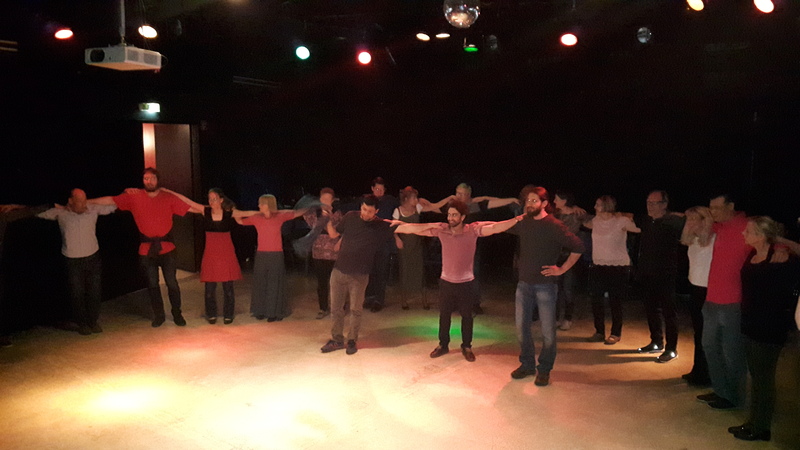 Back to Ballsaal-Palindrone-Halay-City-Marathon: Video to come soon, reprise in 2018! A view over the Thaya floodplain meadows and forests to the Czech Republic, a small picturesque old town including a castle, and a music club in a vaulted cellar dating back to the 14th century: Drosendorf in Lower Austria. Usually renowned jazz muscians perform here. But this time it was Hotel-Haydn-time. Marialena Fernandes and Hotel Palindrone went on stage of the jam-packed Jazzkeller and had a great time. Video upcoming! For Drosendorf-newcomers: Gasthaus Feiler Zum Goldenen Lamm is a traditional guesthouse with genuine food and comfortable rooms. If you want to spend a night more the Polanski-vampire-style, book a room at the castle. 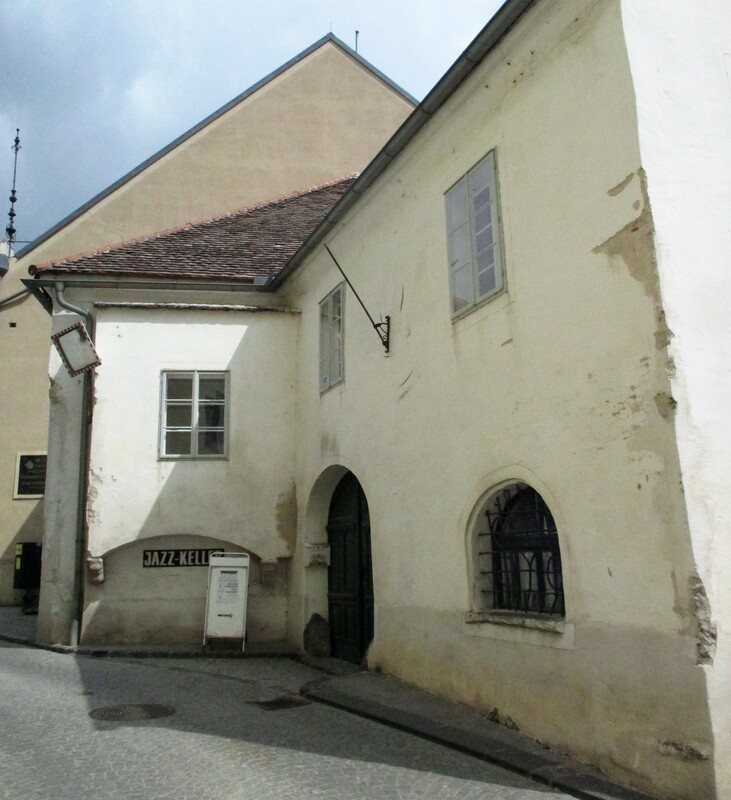 Both places are just 300 metres from the Jazzkeller – a pretty advantageous distance after tasting Weinviertel wines in the music club’s bar.